Cahors the capital of the Lot region in the south-west of France is often overlooked, finding itself somewhat in the shadow of neighboring Bordeaux. However, this gem of a region is not only producing some spectacular wines on par with any good Bordeaux (and at much more competitive prices) it is also the birthplace of Malbec. Famed as the grape of Argentina, and with reason, the climate and soils of the Mendoza region produce awesome examples of what this grape is capable of, however here in Cahors the complex terroir results in some very powerful and fine specimens indeed. Discover this fascinating region with Cellar Tours, we will organize a fantastic experience for you, which takes in some of the best producers in the region, time to explore the delightful town of Cahors itself, as well as gorgeous medieval villages such as Saint-Cirq-Lapopie, savor the taste of the local gastronomy in an array of settings from fine dining in top restaurants to some real treats in local bistros and cafes, all whilst staying in fabulous chateaux hotels. You will travel by luxurious, chauffeur driven Mercedes enabling you to sit back and enjoy the breathtaking scenery. If you are looking to indulge and love fine wine and food, whilst getting slightly off the typical tourist path a tour through the magical Cahors region is perfect for you. Contact us for more information and to receive your personalized itinerary. At your chosen time, your private chauffeur and luxury Mercedes will collect you at your arrival point-Bergerac or Toulouse airport or Cahors train station. 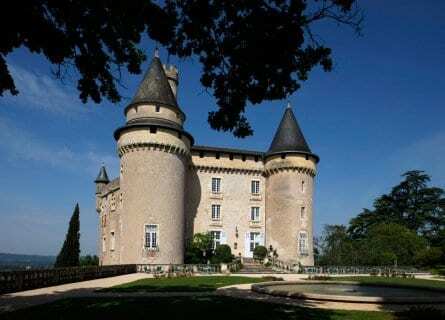 First, you will visit the delightful town of Cahors. A medieval town dating back to the 13th century, the historic center is full of narrow lanes and beautiful townhouses, the cathedral is definitely worthy of a visit, boasting a very attractive cloister. Then a 40-minute drive to your first winery; Clos Triguedina. Here you will enjoy a private tour and tasting with a light lunch. This is a fantastic treat and your VIP tasting will include seven of their best wines including an old vintage of Probus 1997. 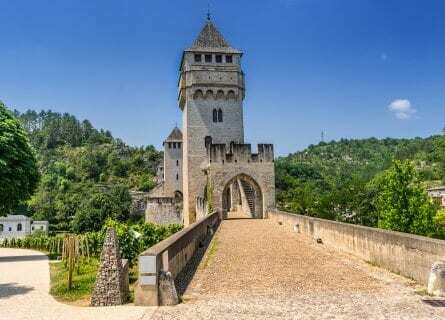 After this sensational welcome to Cahors wines you will move on to your next winery, Château de Mercuès with its striking Château and even more spectacular cellar. It’s not only the setting that will blow you away, but you will also taste a range of their wines all of which use over 70% Malbec in the blends. Another inspiring example of how the Cahors terroir expresses itself in this “black wine”. This captivating Château will also be your overnight destination, so check in, relax and soak up the bewitching atmosphere, Bienvenue à Cahors! A relaxing start this morning and enjoy a leisurely breakfast, before at 10:30 a.m. your chauffeur will collect you for a short 30-minute drive to your first winery of the day; the mythical Château du Cèdre. Family run by brothers Jean-Marc and Pascual, they proudly continue what their father Charles began in the 70s. This dynamic pair will welcome you to try their award-winning, seductive black wine which includes over 90% Malbec-enjoy! Lunch is next at another sterling winery and bistro; Château de Chambert. Famed for being the largest organic and biodynamic vineyard in Cahors. Your table will be waiting for you on their pretty terrace (weather permitting) overlooking the vines or comfy bistro in the grange. Lunch is a laid-back affair including local meats and cheeses, paired with their succulent wines of course. After lunch, a digestive walk around the vines and winery before the mouthwatering finale, tasting the Chambert range. Then arrive back at your fairytale hotel. Settle in and make the most of a free evening. Today is all about discovering the picturesque villages nearby and an awesome fine dining experience to end. 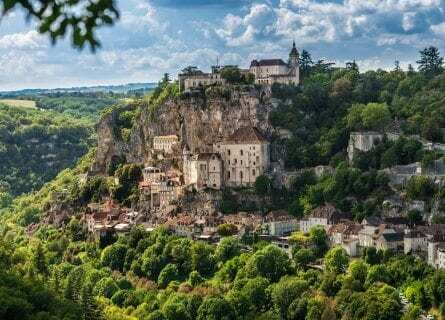 First stop is the stunning village of Rocamadour, literally clinging to the cliffs above the Alzou gorge, this picture postcard, medieval village is dotted in religious buildings, has been an important center of pilgrimage over a number of centuries. Some of the highlights include; Saint Sauveur Basilica, the L’Hospitalet, from where you can take in the best views of the village and the pedestrianized boutique-lined street, where some amazingly beautiful houses can be spotted dating back to the 13th century. Then on to equally as beautiful, Saint-Cirq lapopie, this middle age village is also best discovered on foot, you will work up an appetite for sure, and you will have ample choice for a light bite to eat at a cozy café or wine bar (we recommend you keep it light as tonight you have a gastronomic treat in store!). Saint-Cirq lapopie was in the middle of many feuds over the years, resulting in subsequently bigger and more imposing castles and fortress to be built. Stroll around and soak up the atmosphere which has for centuries and continues to, inspire artists, poets and writers alike. Carry on to the stunning Pech Merle prehistoric cave which is home to authentic prehistoric paintings over 20,000 years old, truly remarkable to see how these extraordinary works of art have been preserved. There is also a very informative museum, worthy of a peek whilst you are there. Arrive back at your castle hotel in the early evening, relax and freshen up before dinner. Dinner will be a gourmet tasting menu at the fine restaurant in your hotel. The tantalizing treats that you will experience this evening may include Bouyssou’s farm pan fried foie gras, Celtuce cooked with tonic, peach with Mexican tarragon and jus with timut pepper, Poached monkfish in a citrus butter, creamy yellow beetroot puree, watercress sauce, Limousine sirloin beef with marrow, dauphine potatoes and slightly smoked vine branch jus, an exquisite selection of cheeses and finishing with something sweet such as Ashanti chocolate mousse, jelly and Malbec reduction, mulled wine sorbet. All perfectly paired with some of the best wines of the region. What a finale! After a last breakfast at your supremely romantic hotel, carry on to your next port of call. 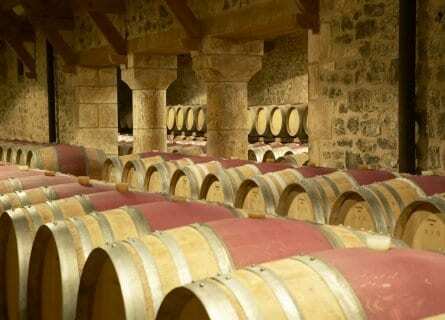 Bordeaux and Dordogne are in easy reach if you would like to add on a few more days to your luxury, chauffeured tour. Bon voyage!